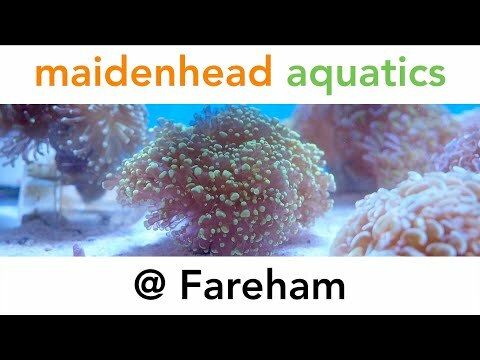 As with all Maidenhead Aquatics stores, all of our staff are practising fishkeepers with many years of experience between them. Each of the full-time members already holds a formal qualification or is in the process of undertaking the Ornamental Aquatic Trade Association's (OATA) Advanced Diploma course in fish health and water chemistry. We are particularly proud of our 'signature' display tank, the 1,200-litre, 3-metre long planted aquarium which adjoins the store entrance. It was first planted during our opening week in December 2007 by a team from TROPICA, Denmark led by Ole Pedersen, the world renowned aquatic plant specialist. Now well established, the plants are growing at an amazing rate. The various Echinodorus species are flowering and reproducing asexually above the tank and are heading for the ceiling whilst the foreground plants have produced a carpet thicker than an Axminster! Fortnightly pruning sessions produce an excess of foliage which we provide to our customers. This healthy, vibrant environment is home to a wonderful shoal of 600 Paracheirodon axelrodi (Cardinal Tetras). They were introduced as juveniles during the aquarium's first month together with eighty Crossocheilus siamensis (Siamese Flying Foxes) to control algal growth whilst the plants became established. The Tetras have spawned and close inspection will find baby Cardinals hiding amongst the dense vegetation. In addition, juvenile angelfishes (Pterophyllum spp.) are orchestrating the Tetras' natural shoaling tendencies, whilst a community of cherry shrimps (Neocaridina spp.) live happily amongst the dense foliage. We have weekly deliveries of aquarium plants for sale with at least 60% of the 350 specimens on offer coming direct from TROPICA's nursery in Denmark. Motherplants and floating plants feature regularly in our selection. If you are a Marine hobbyist then you'll find plenty to interest you in our marine section where, again, regular deliveries provide variety and a selection of healthy fish and corals unrivalled in the area. Live foods are also available weekly. Choose from brine shrimp or river shrimp to give your marines a treat and for your tropical fish; daphnia and bloodworm provide a natural feast. They are available each Friday but be quick because they sell out quickly. Choose from fancy goldfish, livebearers, catfish, Tetras, discus, stingrays and puffer fish in the fish house! A wide selection of healthy livestock awaits the newcomer and experienced aquarists alike. The pond section is housed indoors so no matter the weather conditions outside, our pond fish and plants can be viewed at your leisure in the warm and dry. Our high grade Koi come from a long established Japanese breeder whilst our other pond fish have made a much shorter journey from one of Hampshire's largest, well respected Carp Farms. If you are looking for 'clean', healthy fish for your pond then you need look no further! And should we not have the fish or pond plants you are looking for then we will happily source them for you, at no extra cost, of course. The same offer applies to equipment for your pond or aquarium. If our extensive selection of 'dry goods' doesn't contain what you need then we will move heaven and earth to get it for you, at truly competitive prices! We look forward to greeting you at this, one of the Groups newest stores, where good, old fashioned service and friendly hospitality, blended liberally with innovative ideas and our passion for fishkeeping awaits you.